At the moment my spaceman character is currently being rigged for animation by a rigger extraordinaire. I am really looking forward to moving him around and giving him some character! I hope to have the rig in my hands soon but in the mean time I thought I'd share a character design I painted up late last year with you. I initially designed him for a short film Idea that my wife and I came up with. I still may get back into developing our idea further but for the time being it has been put on a shelf until I have more time to devote to a larger more fully realised short film. 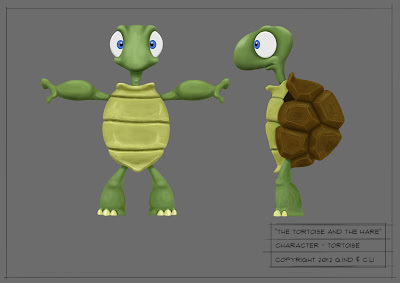 I really like his shell, especially the dimension that the segmented shapes give it. Hopefully I can find the time to develop him a bit more and them translate him into the 3D world!